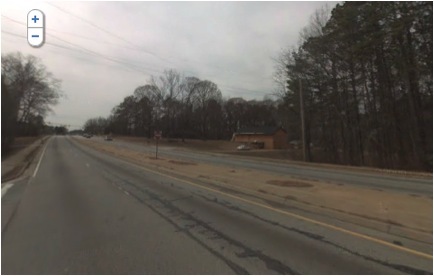 A Google Street View image of the intersection where Raquel Nelson's four-year-old son was killed. There are no crosswalks in sight. We don’t normally report on vehicle crashes here on the Capitol Hill blog, but this was so outrageous we couldn’t help ourselves. The man has previously been convicted of two hit-and-runs – on the same day, in 1997, one of them on the same road where he killed Raquel Nelson’s son. Guy will serve six months for killing the boy, but Nelson will serve up to 36 months – just for crossing the street with her child. Yes, it’s true: they were not in a crosswalk. Are there any crosswalks on that street at all? The conviction does not sit well with Sally Flocks, president and CEO of PEDS, a pedestrian advocacy organization. The Atlanta-Sandy-Springs-Marietta, Georgia metro area ranks 11th in the country for most dangerous streets for pedestrians, according to Transportation for America’s recent report on pedestrian safety and street design. The region had nearly 800 pedestrian deaths between 2000 and 2009. Despite the fact that Atlanta-area municipalities continue to build roads, like the one where Nelson’s son was killed, with inadequate pedestrian crossings and sidewalks, and despite the fact that the federal government continues to vastly underfund pedestrian safety infrastructure on federally-funded roads and highways, the courts have pointed the finger at Nelson, blaming her for the death of her son on a road that was designed with no regard for pedestrian safety. H/t to Anne Lutz Fernandez for bringing this story to our attention. After Casey Anthony was quitted how can this injustice go unoticed. I am sick to my stomach! What kind of idiotic 18th Century government lets a drunk off with a slap on the wrist and prosecutes a mother of three children for trying to get across the street? Shame on them! I am searching for informtaion on a car crash near or on Capital Hill in the 93-95 time. A drunk driver killed one of her children in her car. First name is believed to be Tanya. Anyone know anything? Although it probably wasn’t the best idea ever to cross an unsafe road like that one with her children, it certainly doesn’t deserve a prison sentence, let alone one that’s six times more severe than that of the person who actually killed the child, who was also drinking and driving. Something’s really not right here. What moron even brought charges & what kind of morons in a jury would convict her. This has to be one of the most pathetic actions ever taken.What nation would even consider bringing charges such as these.What are you,back in the middle ages,do you still burn witches.No wonder your country is going down the tubes.The sooner the better.Oh well is has been stated that with your current economy/morales you will be shooting each other in the streets within a year. This story makes me sick to my stomach. They better drop the charges against this grieving mother. 800 deaths in 9 years! Fire every politician in the state!! This is INSANE!! This is not justice in America – this must have been a paid off judge and jury. We need to get drunk drivers off the road! This man has done this before and is getting off with a slap on the wrist again? And the grieving mom is serving the sentence for such a crime? Our judicial system is to blame for allowing these type of crimes to continue with no punishment for the drunk driver! Take his license away for good!! He doesn’t deserve to drive a vehicle, let him ride a bike. the judge could easily have thrown the case, because of the absurdity of the charge – vehicular homicide???!!! She wasn’t in a vehicle!!! The hit-and-run drunk was!!! That poor woman loses her child to a repeat hit-and-run drunk, on a notoriously dangerous street???!!! And now she must spend three years in JAIL???!!! The brain-dead prosecutor (what is he? a nazi? ), the judge, and all the jurors should be drawn and quartered for the vicious scum they all are. The US and Somalia are the only countries in the world that mete out life sentences to children. I guess it isn’t surprising that such a pack of brain-dead animals exist in the “justice” system in Georgia. And we say the Middle East is oppressive towards women ? That is typical of our lovely judicial system. The one who kills gets next to nothing. The one who steals a loaf of bread to feed the family gets life. Remember the law of the land. If you are going to do a crime, make sure you kill someone in the process. You will be receive a small sentence. I read that she was sentenced by a jury. Where was the judge with some common sense. This poor woman lost her baby!!!!!!!!!!!!!!!!! Who’s hand did the murderer butter? Casey Anthony is a monster, but she “got off” (she was convicted of a lesser charge and received “time served”) because the DA failed to prove beyond a reasonabe doubt that she committed the crime that she was charged with. Did the jury to the right thing? YES, because the DA didn’t prove beyond a reasonable doubt that she was guilty. The ReTHUGS have been spending like drunken sailors on “Defense” (especially Iraq & Afganistan) and the “War on Drugs”, but that’s ok? 1) You shouldn’t drive or operate machinery (Heavy or light) until you adjust to your medicaiton and know how it affects you, drowsiness is a common side effect before you adjust to the medications. 2) Alcohol enhances the drowsiness of opioids and opioids enhance the drowsiness and other impairments caused by alcohol. WTF is this? Americans are crazy. WHAAAAATT???? Oooooh, this would raise duch an enormous outrage over this in the Netherlands. It would lead to politicians and judges getting fired and an very, very long investigation. I was right in thinking that Americans are just about one of the most oppressed people in the world, and they don’t even know it. The Streets and the Courts Failed Raquel Nelson. Can Advocacy Save Her?